Right from the beginning of the album as the first track opens with an ethereal voice floating out of your speakers at you accompanied by strings, harp and kettle drums the listener is drawn into David's peaceful world which is one that is sure to please those who are looking for brief respite from the tensions of the work a day world. While the music is not always as mysterious or as slow of a tempo as this opening track David does blend and mix the tracks so as to maintain the mystery and the serenity of the overall theme even though individual tracks may vary somewhat in musical intensity. I've always appreciated an artist who can skillfully combine seemingly disparate musical elements into a homogenous whole that is more than the sum of its individual parts but still also able to stay true to the overall feeling of the album. The Veil of Whispers is difficult to categorize as an album within a certain musical style of music and so I will not attempt to do that in this review. Rather I will try to give my impressions of the various styles that it covers during the course of its 62 minute length and let the reader decide exactly what that means to them. A couple of the songs are rather short in comparison to the majority of the songs on this album and in my mind they almost serve as interludes between the larger selections of music. After having listened to ambient music for quite a number of years with some single selections that are 20 or 30 minutes long I tend to think of compositions that are around the 3 minute or under range as being short. Scene Through the Mist, The Veil of Whispers and A New Memory tend to fall into this shorter category but make no mistake, they are brief but still enjoyable as stand alone compositions and definitely "earn their keep" as part of the flow of this album. One of my favorite songs on this album is track 8 which is called Persuasions's Dance which clocks in at 5:54 which is closer to the average song length for this album. Persuassion's Dance is a dreamy yet rhythmic piece that features some laid back grooves that builds on a foundation of bells and what sounds like a sampled guitar or pedal steel guitar that is splashed throughout the song to offer the listener some colorful sounds to punctuate certain sections of the song. The piano is the main instrument throughout and acts as the glue that holds these unique elements together within the framework of this song. The song ends as it began gently and with the sound of bells fading away. 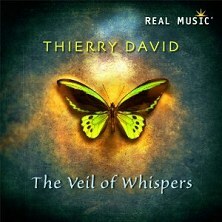 I think of an album like The Veil of Whispers more as a showcase for the talents of what Thierry David is capable of. When it comes to taking a variety of styles and combining them into something that doesn't sound disjointed or piecemeal Thierry proves he is more than up to that challenge as he so aptly shows us with each song on The Veil of Whispers. Rather each composition is like a square of material that makes up the pattern of a beautiful quilt. In the end it represents a work of art that is viewed or in this case listened to as a single musical expression that shows the listener the overall design that is achieved through the various tracks that make up the whole. Thierry David interweaves the music on this album in an impressive manner while challenging you the listener to allow the ebb and flow of the thirteen tracks on this album to take you on a sonic journey. He challenges you to open up to the sounds of electric guitar on the song Ecstasy or the exotic voice that serenades you on Orient Priestess as simply vehicles to convey you through the landscape that he has laid out for your trip. 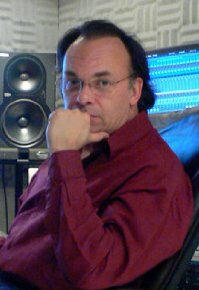 Thierry David obviously enjoys his work and his skills are on display in these well crafted songs that he has chosen to include on this album. Artists have to be careful of throwing everything they have into a single project because it runs the risk of being fragmented and lacking any kind of cohesion. The Veil of Whispers avoids this problem by offering the listener a wide range of musical experiences as they listen but always keeping the compass pointed towards home. Thierry David certainly enhances his reputation with this release by offering us a sound palette that has a little something for everyone. I'll let you be the judge of how you'd like to classify the style. Who knows maybe you might even decide that classifying music by type isn't something you want to do anymore. Maybe good music is simply good music. AV recommends this disc.